iPartsPlusMore Reusable Keurig K-Cups Offer An Unmatched Way Of Having Your Coffee The Way You Want It. Top Quality: Our Premium K-Cup Reusable Keurig Coffee Filters Are Made From 100% BPA Free Material & Food Grade Stainless Steel. Enjoy Your Own Coffee Brewed With Your Keurig Machine. 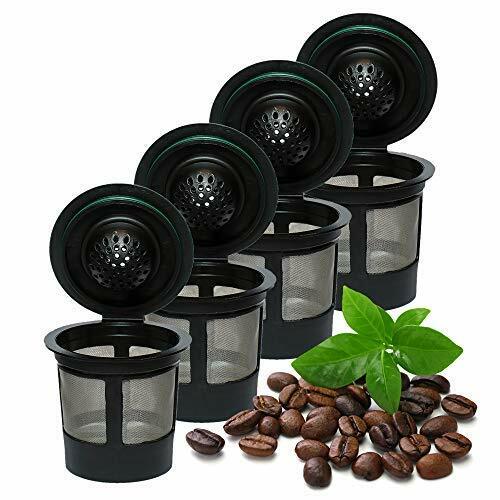 Compatible With: All Keurig 1.0 & 2.0 Models: K15, K31, K40, K44, K45, K50, K60, K66, K70, K77, K80, K100, K200, K250, K300, K350, K360, K400, K450, K460, K500, K550, K560, B31, B40, B44, B50, B60, B66, B70, B77, B100, B140, B200 As Well As The Following Keurig Brewers: Keurig Elite, Keurig Select, Keurig Classic, Keurig Ultra, Keurig Special Edition, Keurig Ultimate, and The Keurig Platinum. Breville K Cup, Mr. Coffee K Cup & Cuisinart K Cup Compatible As Well.Not Compatible With: Keurig Vue, B30, B130, B145, B150, B155, K30, K130, K145, K155, K150 And Other Commercial Models Dimensions: 2” x 2” x 2.9” Weight: 1.6 Ounces Make The Smart Choice, Help Yourself Save Up To 80% On Overpriced Prepackaged Coffee Filters While Reducing Your Carbon Footprint In The World. ⭐ UNIVERSALLY COMPATIBLE: Eco Friendly Premium K-Cups Are Universally Compatible with Keurig most 1.0 & 2.0 Models: K200, K250, K300, K350, K360, K400, K450, K460, K500, K550, K560, K15, K31, K40, K44, K45, K50, K60, K66, K70, K77, K80, K100, B31, B40, B44, B50, B60, B66, B70, B77, B100, B140, B200 As Well As These Brewers: Keurig Elite, Select, Classic, Ultra, Special Edition, Ultimate, and Platinum. Breville K Cup, Mr. Coffee K Cup. Filter may not work with K400 and Keurig Mini. ⭐ EASY TO USE: Our 4 Pack Refillable K-Cups Are Hassle Free And Do Not Require Swapping Out The Keurig Filter Holder Or Tampering Of Any Kind To Fit Seamlessly Into Every Keurig Or Any Other Brewer. ⭐ ECO SAFE: Refillable K-Cups Aren't Only Excellent For You And Your Personal Enjoyment, They Are Also Extremely Helpful To Our Planet. Help Reduce Your Carbon Footprint ♻ By Re Using Your Refillable K-Cups All While Enjoying Your Favorite Coffee ☕ Brewed With The Help Of Your Keurig Machine. If you have any questions about this product by iPartsPlusMore, contact us by completing and submitting the form below. If you are looking for a specif part number, please include it with your message.